You've stumbled across the best transportation in Ann Arbor! Ann Arbor is a quaint and charming college city located in Washtenaw County, Michigan. This city is known for it's lovely atmosphere, many shops and boutiques, collegiate accomplishments in study and sports, and much more. You're sure to have a great time touring the streets of Ann Arbor, peering into the lovely charming shops, eating at the top notch restaurants, and once night falls, partying to your heart's content. It's safe to say that you aren't going to run out of things to do when you decide to visit the city of Ann Arbor. When you're in the area looking for Ann Arbor Party Bus transportation that accommodates a group of travellers, you're going to want to research all of your options. After all, with how many different transportation providers there are in the area, you want to be sure you're getting the most bang for your buck. That's where Ann Arbor Limos comes in! We're known for our affordable, high class transportation in our limousines, limo vans, and limo buses. 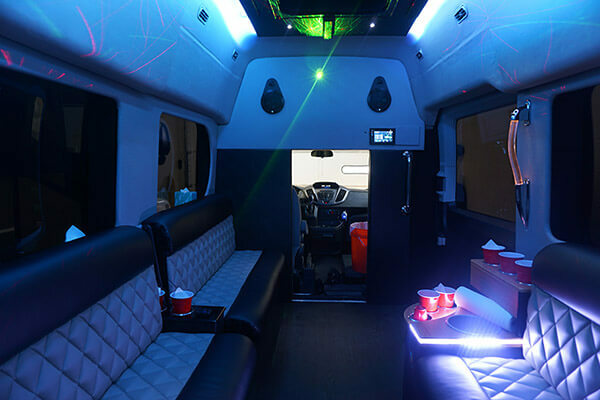 Each of our limousines and limo buses is fully customized for us, so you can bet you'll have a vehicle with a unique interior design and great features. 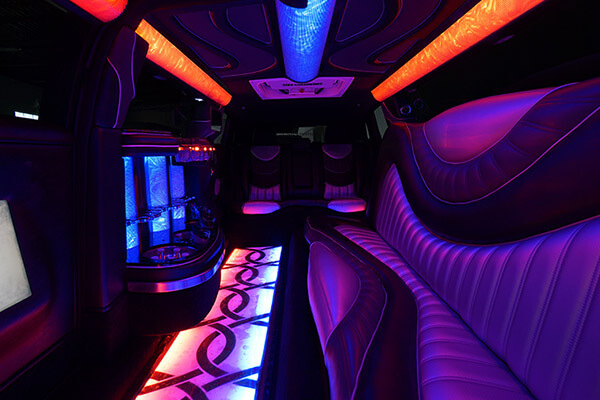 Plush leather limo seating, hardwood floors, colorful lighting, custom ceiling designs, TVs, DVD players, amazing stereo systems and much, much more! Our vehicles are top-of-the-line. But great Ann Arbor Limousine vehicles aren't all we offer. No, we have also go above and beyond in the customer service department. We only hire the best, so we have a dedicated team of professionals that will get you the best vehicle at the best price, and amazing chauffeurs that are committed to providing excellent service. And it's all available at the best rates! Once you use our luxury transport services, you aren't going to want to go anywhere else for your next special event. Click on the tabs above to learn more about all we have to offer! We've done our best to put together a wide array of information and photographs for you so that you can really get a feel for our business, but if you'd rather get a hands-on experience, come to our place of business and take the grand tour! We'd be thrilled for you to meet our staff and take a look at our stunning vehicles. We've built up what we like to think of as a very impressive business, and our goal is always to provide the customer with an absolutely unforgettable good time on the road. There's nothing that would make us happier than to shake your hand and show you in person exactly what makes our vehicles so worth renting. But again, it isn't just a vehicle that you are renting. You're opening up a whole world of enjoyment and entertainment, with our enticing features and our incredibly professional chauffeurs. You're giving yourself a long overdue gift when you choose limousine travel over all the other boring options out there. You deserve that gift after all the hard work that you have done! Treat yourself to an evening under the glowing lights, with the music booming and the HDTVs broadcasting their crystal clear images to entertain you. Pour yourself a drink at our beautiful built-in bar and just relax the night away while you chat it up with your good friends and family. Good times await and there's nothing standing between you and those special moments than a quick phone call! Dial us up tonight. Our limousines and limo buses can't be beat. We provide service for all of the following events and so many more. Whatever you're celebrating in Ann Arbor, we can take you in style. Bar hop around town, get reliable transportation for your wedding party, tailgate, or head to a concert! We're so excited about the possibility of taking you to all of your exciting events in the A2 area! Whether it's bar hopping, a wedding, a sporting event, or a concert, we have got you covered! You'll enjoy skipping the navigation concerns, ignoring the traffic, and totally disregarding the issue of finding a parking because you will be picked up and dropped off right at the door! A mind blowing experience awaits you and you'll have such a stress-free night that you'll feel like you took a mini vacation! What kind of event is it that you're attending? How can we work our services into it to make your night even more one-of-a-kind and special? Whatever ideas you may have, whether it's for something traditional like a wedding or something really modern like a night of brewery tours and wine tastings, get in touch with us and let's talk about the ways in which we can make it even more unforgettable. The right transportation can really take the concerns and worries out of your evening and leave you with the most relaxing night with good friends. Spend time chatting it up instead of fighting the urge to give in to road rage! Spend some real quality time with your friends and family instead of wasting all that time on driving. Travel together in one incredible vehicle and really enjoy your time together. It's the best gift you can give if it's been a while and you want to reconnect!